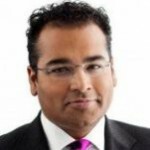 Krishnan Guru-Murthy is a journalist presenting the Channel 4 News as well as foreign affairs series Unreported World. This has seen him embed with an Iraqi bomb squad and travel to South Africa to examine lingering and on-going social problems post-apartheid. People of a certain generation probably remember Krishnan as the host of BBC’s Newsround. Staying at the BBC for ten years, Krishnan also worked on Newsnight as a reporter and was one of the presenters for the launch of the rolling news channel, BBC News 24. Whilst at the BBC he covered he 1997 General Election, the death of Diana Princess of Wales and hosted the National Lottery. Krishnan is well-known for being outspoken when asked to interview celebrities, believing that he has a responsibility as a journalist to ask much tougher questions than many of his contemporaries. Both Robert Downey Jr and director Quentin Tarantino have walked out on him during interviews for the Channel 4 News.